Some applications stopped working properly after upgrading to OS X 10.9 Mavericks. You need to enable access for assistive devices for the application. 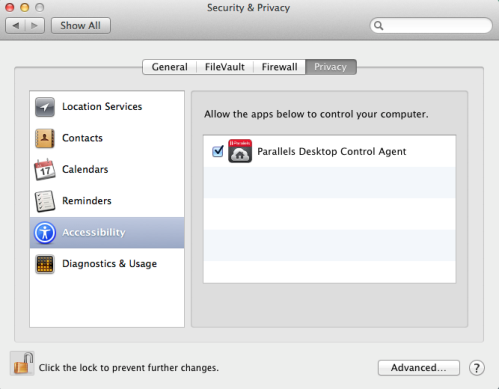 In OS X 10.9 Mavericks the settings for enabling the access for assistive devices were moved from the Accessibility pane to the Security & Privacy pane. Now locate your application under "Allow the apps below to control your computer" list (the list is populated automatically by OS X) and click on the check-box next to it. If the list does not contain Parallels Desktop, then drag and drop it manually from /Applications/ directory.